To get to the Skydeck, you will need to go up to the 103rd floor of the Willis Tower (former Sears Tower), that was once the tallest building in the world. You get to the top by elevator in 60 seconds, feeling the pressure changing as you go up. Soon you will be 1,353 feet above the ground and from there you will not only be able to see across the state of Illinois, but also across Lake Michigan and beyond, all the way to the states of Indiana, Michigan and Wisconsin – when the weather is clear. If you are flexible with your schedule, keep this in mind. At the Skydeck you can also try out a retractable glass box, which can be elongated from the facade, so that a visitor is able to look through the glass and see the street down below. 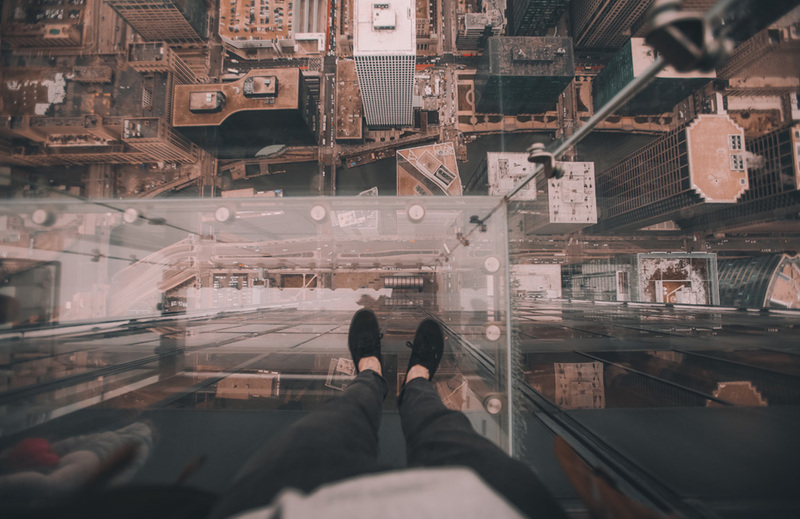 This balcony-of-a-kind, casually called The Ledge, overlooks South Wacker Drive and offers a rare experience to whoever dares step on the hanging glass. For amazing 360 degrees views of the dazzling Chicago’s skyline and beautiful Lake Michigan, head to the John Hancock Building and visit 360 Chicago observation deck. A thousand feet above the popular Magnificent Mile, at the 94th floor, you will be able to see as far as 50 miles away and will even get a glimpse of the three surrounding states. You might also want to try out TILT, a platform – or we could even say a window – that tilts 30 degrees over Michigan Avenue. One more out-of-the-ordinary experience that will linger in your memory for long and make your visit or staying in the city of Chicago truly outstanding.